Home appliance e-tailer is predicting its biggest day for online sales on Friday and has already seen a 70% jump in traffic to the Black Friday area of its website, as customers seek deals on branded appliances and household gadgets. AppliancesDirect.co.uk marketing manager Mark Kelly said: “Black Friday 2017 was our most successful to date and so we have high expectations for this year – we anticipate it will be our busiest to date. 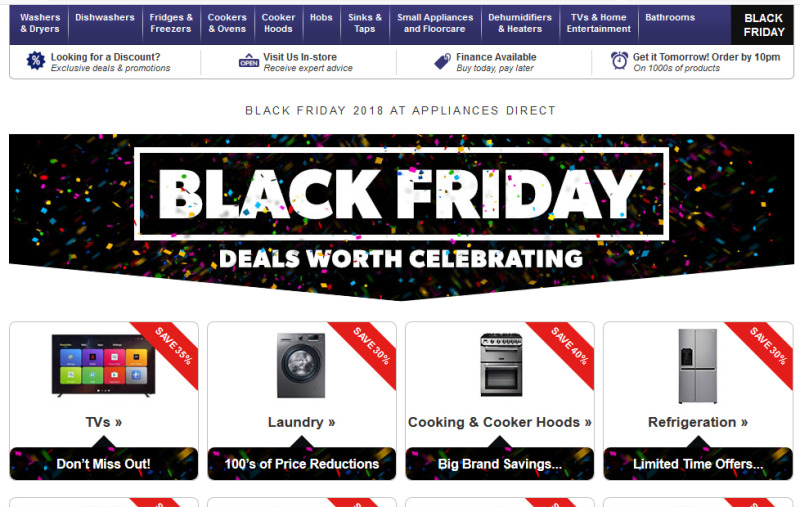 “The Appliances Direct website has already seen a 70% increase in traffic to the Black Friday deals landing page and a 57% increase in sales over the past week. “This year, we are anticipating up to 10 times our usual traffic volumes to the website this Black Friday and Cyber Monday weekend, as savvy shoppers look to snap up some great deals ahead of the festive season. As well as 4K smart TVs, the company believes small appliances, such as coffee machines, stand mixers, air fryers and juicers will be big sellers on Black Friday, as they are often bought as gifts for Christmas.